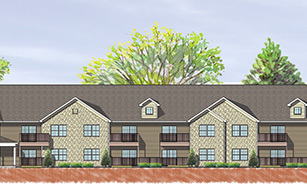 The Mews II at Baldwin Place is now is accepting applications for 75 affirmatively marketed fair and affordable rental apartments for seniors age 55 and older. Located in the beautiful Westchester community of Baldwin in the Town of Somers, this new development is conveniently located on Clayton Blvd just off Route 6 and is adjacent to the Somers Commons Shopping Center with its variety of stores and restaurants. In addition, the Bee-Line bus provides easy access to the nearby Jefferson Valley Mall, the City of Peekskill and the City of White Plains. There will be 61 one-bedroom apartment averaging 720 square feet in size and 14 two-bedroom apartments which average 980 square feet in size located in two elevator buildings. All apartments have either private patios or balconies and tenant controlled air conditioning. The many amenities include on-site parking, a community room, lounges, a computer room and laundry facilities. In addition, the Town of Somers offers many services to seniors including a Meals-on-Wheels program as well as transportation to the local Senior Citizens Club. Eligibility Requirements: In order to qualify for the apartments, household income must be at or below 50 percent and up to 60 percent area median income for Westchester County and the applicant or co-applicant must be at least 55 years of age. See HUD Income Guidelines. For More Information and How to Apply: Applications are currently available. Please note that the deadline to participate in the lottery has passed, but applications will continue to be accepted for the waitlist. Go to application in English. Go to The Mews II brochure. For more information, contact the Housing Action Council by e-mail at hac@affordablehomes.org, or by phone at (914)-332-4144.